Bizzy, Tiger, Yoon Mi Rae. The K-hip hop powerhouses that form MFBTY are back with their newest album, Wondaland. Following a preview of song “BuckuBucku,” the trio dropped the MV for title track, “Bang Diggy Bang Bang.” The song is definitely a banger. And what follows is a fun ride with MFBTY. There is one Yoon Mi Rae line in particular that draws attention: “Heaven and Earth Dark and Yellow, it’s in my blood.” While it doesn’t necessarily need to be read into too much, perhaps it could also been seen as a sly remark about Yoon Mi Rae’s racial and cultural back ground (which is mentioned below). Or it could simply be her allegedly paraphrasing a line from “The Thousand Character Classic” poem. “Bang Diggy Bang Bang” is a song about doing what makes you happy and standing up against those who would push you down. This strength and freedom is reflected in the music and MV. Desi culture plays a big part in both the music and the MV. “Bang Diggy Bang Bang” would have been perfect for the Desi playlist and for MFBTY, its use seems like an example of “go big or go home.” It is hard to ignore the sitar, which is so predominantly displayed. The instrumentation can be classified in the area of the classical Indian music style Hindustani. MFBTY overlaps this instrumentation with more of the usual pop/hip-hop elements of the chorus and bridge to create a fusion that is energetic and fun. Additionally, Kim Ban Jang (of indie band, Windy City) adds a funky beat to the otherwise already unique track. It’s nice to see an artist do such combinations without jumping head-first into a pool of offensiveness. Also, MFBTY adds another Desi musical element to the track. When transitioning between certain parts, such as chorus and verse, you can hear a spoken portion that is not part of the lyrics. These parts are speaking the parts played on the tabla, a percussion instrument, and the chanting in Hindustani is called bol. So, not only did MFBTY use Hindustani instrumentation, they also used chanting associated with the music. Matching this with simple, progressive dance steps draws more attention to the chanting itself. The use of dry colors, which is associated with the Hindu Indian festival of Holi, is very present. Traditionally, on the second day of the festival, celebrants spray or douse each other in colors in a free-for-all. However, the ritual of dousing people with dry colors has become the appropriated-cultural-ritual de jour lately – look no further than the color runs. While MFBTY may get a bit of side-eyeing, they avoid the eye rolls and criticism by not throwing the dry colors at each other. Desi culture is not the only culture being represented in “Bang Diggy Bang Bang.” There’s also Yoon Mi Rae’s own culture: representation of her blackness. Some people either overlook or simply forget that Yoon Mi Rae is biracial, for whatever reason, and the MV is a firm reminder of this fact. She proudly wears her braids, and isn’t doing it to be cool or because it’s “hip hop;” it’s her own cultural signifier. 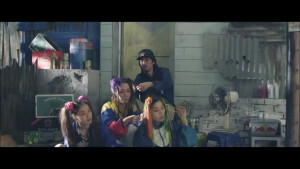 You also see Tiger JK joining in on this depiction of the black culture, as he not only wears braids (if his Twitter is any indication, Yoon Mi Rae braided his hair), you can also see him helping braid the weave into another girl’s hair. Additionally, dance plays a big part in the MV. Even Tiger and Bizzy get involved. The dance moves include direct inspiration from West African dance and African-American stepping. The use of these dances doesn’t appear clichéd or forced, but rather the integration of Yoon Mi Rae’s own background in a song about being oneself. The combination of all these cultural forces creates a more fun fusion, and the fun doesn’t stop there. First, there’s the Rap Monster appearance. If you listened to “BuckuBucku,” you know that Rap Monster’s part mentions something about jasmine. Well, the line from the song, to put it in slightly more respectable terms, is that his excrement smells like jasmine. So the scene depicts Rap Monster using the restroom (which subsequently explodes in a cloud of green powder), and then a shot of “jasmine” written on toilet paper. Quite an amusing allusion. Then there is the pillow fight. Remind us never to get in a pillow fight with Yoon Mi Rae: the look on her face harkens back to her “Get It In” MV. Fierceness aside, the pillow fight scene is an image of pure fun and release. Hitting each other and playing in the feathers is so childlike that it fits the idea of an open life and not letting people keep you down. Overall, the MV is very bright, from the outfits to the hair. This colorful aspect livens up the atmosphere to reflect the joy of just being yourself. From the music to the MV, “Bang Diggy Bang Bang” seems to be a boisterous cultural explosion paired with a catchy hook and proud lyrics. MFBTY was able to combine multiple cultural signifiers, musical styles, and their own brand of hip hop to create a fantastically vibrant title track and MV. Whatever “Bang Diggy Bang Bang” means, you’ll keep doing it all day.